Open Letter to those Oromo Elites Zelalem Eshete, Ph.D. If we can’t accept each other as our own kind, based on the common denominator that we are all the same human beings, it is easier for us to be inhumane and do inhumane things to each other. We are all guilty and we take responsibility for our actions and inactions. Now, we all start to see each other as ones created in the image of God. There is no better honor for us to be identified than being known as God’s image bearer. I write this letter to those Oromo elites who have difficulty saying and meaning Ethiopia. I want to make a case for their need for a transformed heart to see and reflect the beauty of Ethiopia, which comprises more than 80 ethnics with nothing but grace and love in their beings. The fight among elites need to give way to the reality of the 100 million people who have a heart to see each other as beloved family. 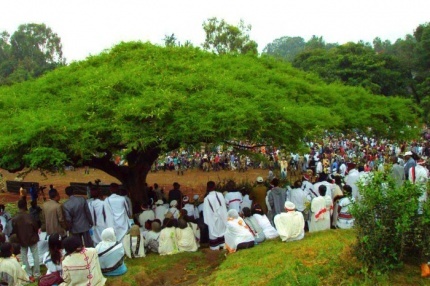 The Oromo elites are now on sacred ground to rise up to the destiny heaven has bestowed in the name – Oromo. Your thesis that proposes you “embrace Ethiopia when there is democracy and equality in Ethiopia” is obsolete at this momentous time. This thesis implies that the other ethnic people are not enlightened enough to seek democracy and equality in Ethiopia. It also implies that there is one entity among us to give you or assure you democracy as a gift. The fact of the matter is that democracy and equality are what we all make of ourselves as we stand and work together as one people towards Ethiopia we all aspire. We have no option for failure in making it to true democracy and true equality. The people safeguard this vision. There is no ultimatum to be given, only responsibility to be taken. Those Oromo elites who seem to ignore Ethiopia will now need to champion Ethiopia in love and with love, not only for Oromo but for all people. Now that an Oromo coined “MEDEMER” and rose to the highest Office of the land, the whole Ethiopia celebrated and embraced Dr. Abiy Ahmed with great joy. We all saw him as a son of Ethiopia, our own kind, congruent to the truth. All people from all walks of life, all religions, all political backgrounds, all ethnic groups loved this hero of love. Now the burden of responsibility is on those Oromo elites to advocate for a united Ethiopia more than any other. Don’t go there, you know it, I am not talking about unity in uniformity. Those elites need to be inclusive and see us all as your own kind. That is the meaning of Ethiopia the beautiful – we are family united in purpose on a road towards one Africa. Getting to power is not what makes history at all, instead what one does with leadership responsibility is what makes a true lasting legacy. This story of hope came true with Dr. Abiy Ahmed and Obo Lemma Megersa in association with others. Now we are here to witness our “difficult” elites join the spirit of Team Lemma by embracing mother Ethiopia in all her glory, thereby building us all as one big intelligent family. This is not prophecy, it is an understanding of the true picture of the Oromo people. Oromo people and Ethiopia are inseparable. It is time for you to become a true reflection of this decent loving people we know as Oromo. The time of division is over. The time to unite has arrived. Now those Oromo elites all need to evolve from Oromo first to Ethiopia first as proud Oromos. We choose to grow up in our identification from being known as an Oromo or Amhara or Benishangul-Gumuz or Gambela or Harari or Somali or Southern Nations, Nationalities and Peoples or Tigray to becoming Ethiopian as connected and united people. We choose to come to be known as we truly are – simply people. We define the mystery of Ethiopia as one people who are the richest ever in diversity and indivisible in unity for eternity. That is when the world come to refer to us as godly people. That is the miracle of love yet to be manifested in our land as we choose to be known as we truly are. That being said, let us also not lose sight of the big picture in that Ethiopia is not in the hands of Dr. Abiy Ahmed or in the hands of the Oromo or anyone for that matter. Ethiopia is in the hands of our Creator. We witnessed an uncontested touch of the divine in the new journey of Ethiopia. We ponder in our hearts saying may be Dr. Abiy Ahmed is entrusted to be the Moses of our time, and as a result we keep him in our prayers day and night. We open our ears and eyes to hear and watch the news and get anxious and lose sleep. When we are stressed too much, we are reminded to close our ears and eyes to pray and hear our Creator speak in our hearts. Then we open our eyes and our ears, this time with the awareness that the One who started this journey of Ethiopia is faithful to take it to the finish line. He will bless us indeed.